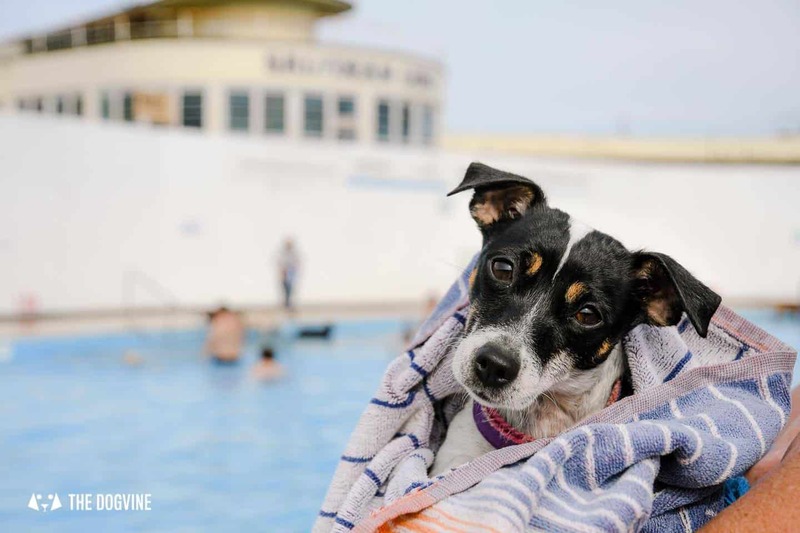 Oh my dog, we can’t get over what an amazing day out for dogs it was at the Saltdean Lido Dog Swim! 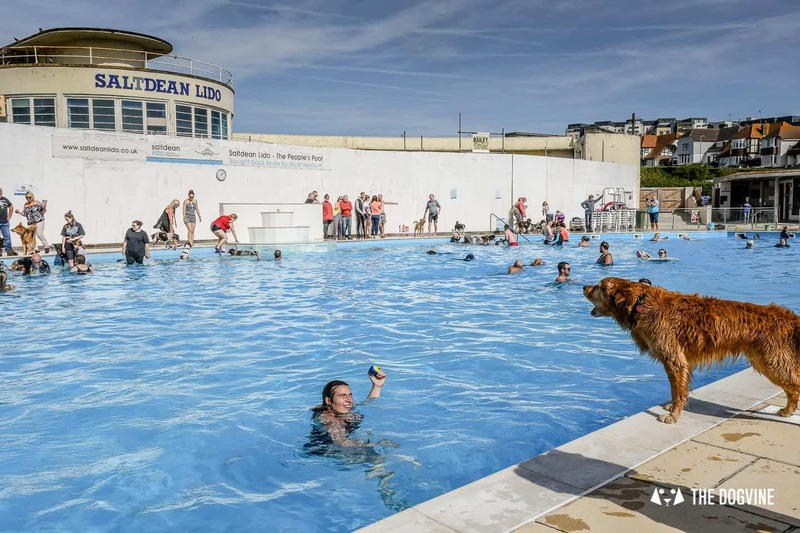 For those who don’t know, this weekend was the second year Saltdean Lido just outside Brighton opened its doors to dogs for the end of season dog swim and to say dogs (and humans) loved it would be a major understatement. So what is the canine craziness all about? 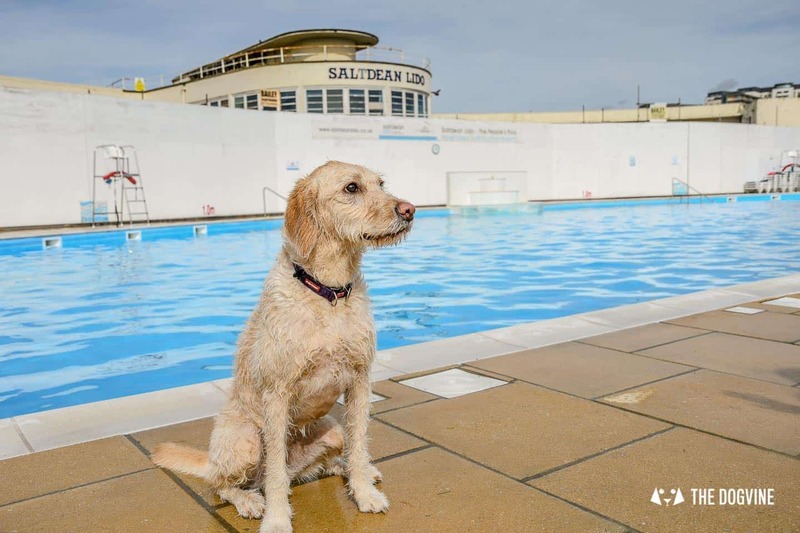 In a nutshell for one weekend a year only, dogs take over the Saltdean Lido at the end of the swim season with all proceeds from the Saltdean Lido Dog Swim going to support the upkeep of this stunning pool. 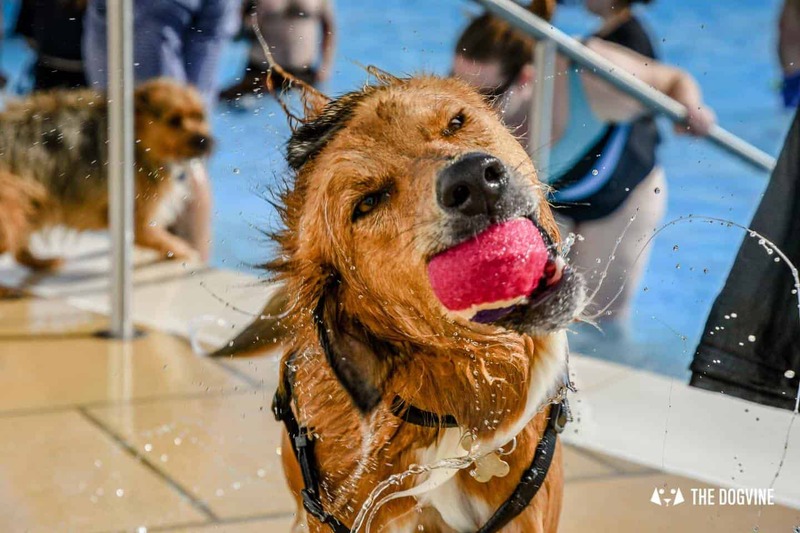 Sessions run in two-hour slots and humans can buy tickets to join in and swim or just watch as myself and Natasha (of Natasha Balletta Photography) did. 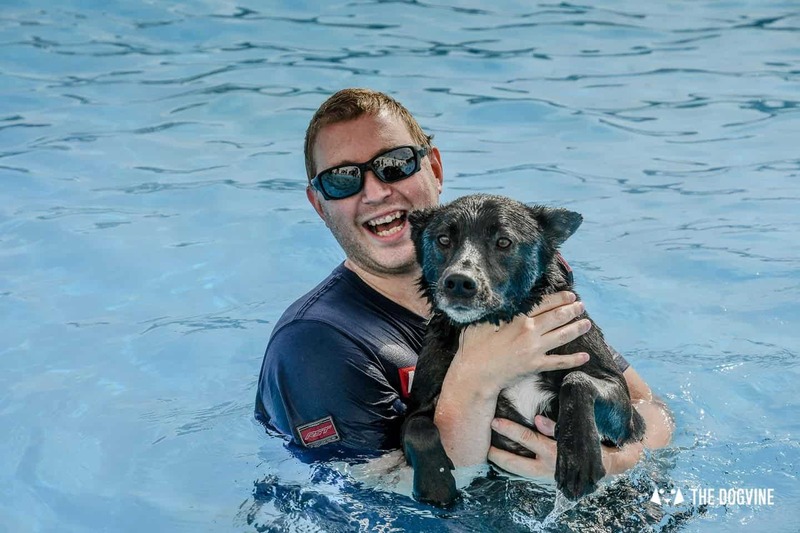 If your dog is swimming, there must be at least one human swimming as well for obvious safety reasons. 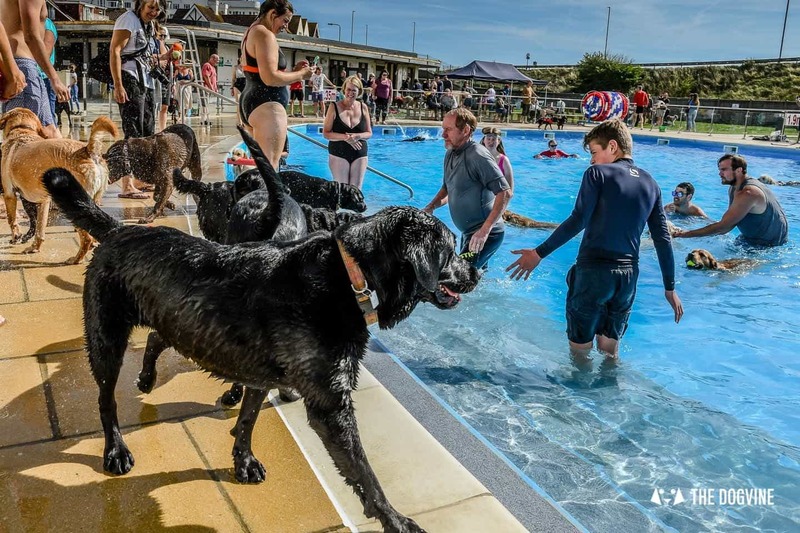 The event was sold out (no surprises there) and there were plenty of local dogs who came along as well as several who had come down from London to join in the fun like Fozzy and Riley. I had decided not to take Belinha as to she won’t even put a paw in water voluntarily let alone go for a swim. 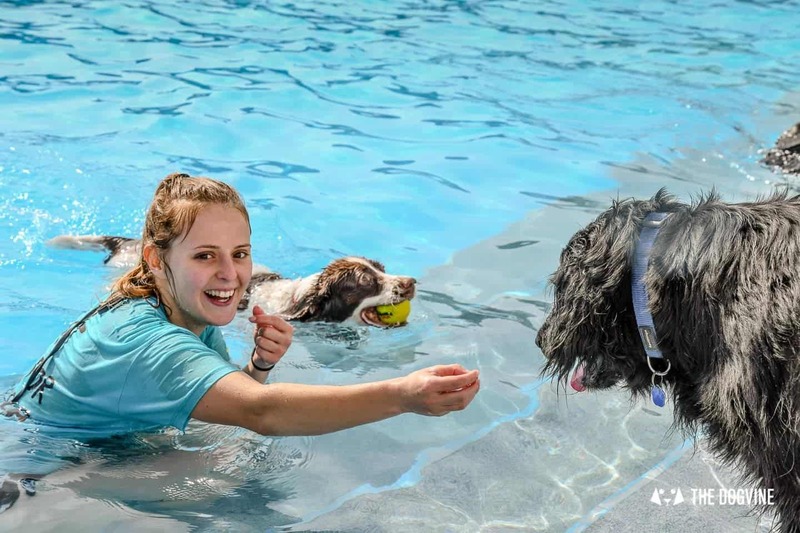 From the moment our session started, the dogs were absolutely giddy with excitement and probably couldn’t believe their luck at being let loose in the giant pool! Dogs of all shapes and sizes were making a splash but several more than others, throwing themselves into the pool without a care in the world, regardless of who was in the water. 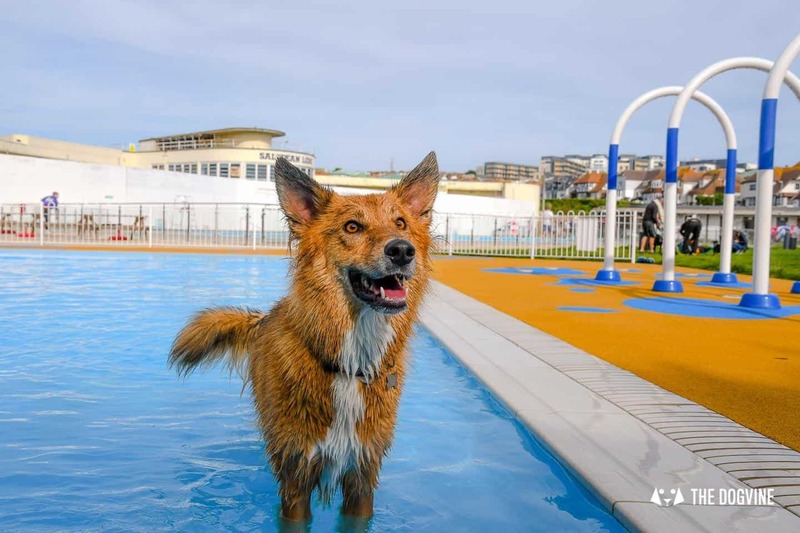 Those who weren’t quite so sure about the big pool, could dip their paws into the children’s paddling pool to get used to things. Although we did see a couple of pups who were having none of that either! 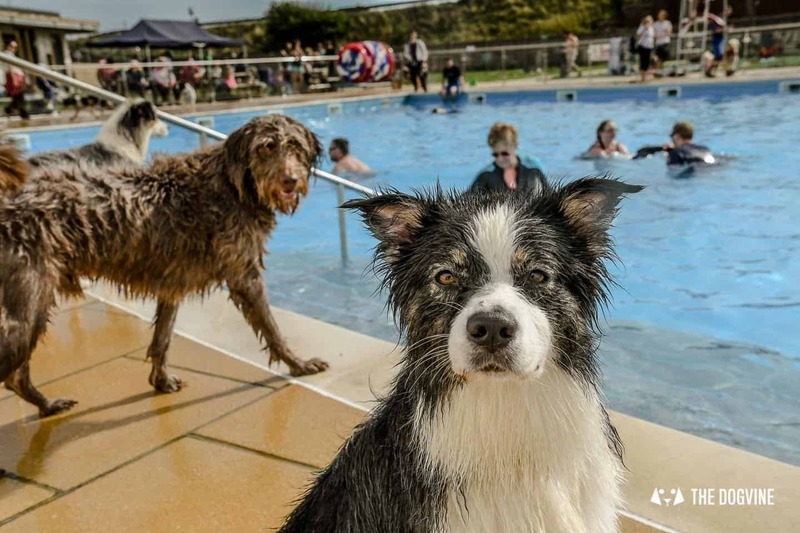 It wasn’t just experienced doggy swimmers who came along. 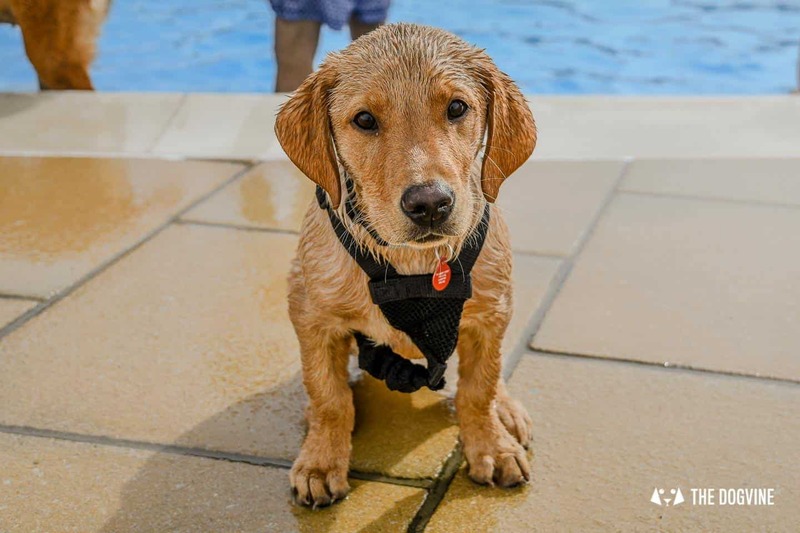 For two adorable puppies, Bruno the Golden Labrador and Loki the Labrador Staffie Cross, not only was it their first time having a go at swimming but also their first major outing. What a way to get to know the big outside world! Both took it completely in their stride and graduated pretty quickly from the puppy pool to the big dogs pool. I was also truly touched to meet Pepsi the Flat Coated Retriever whose owner had told me was suffering from Cancer and had been given a month to live. 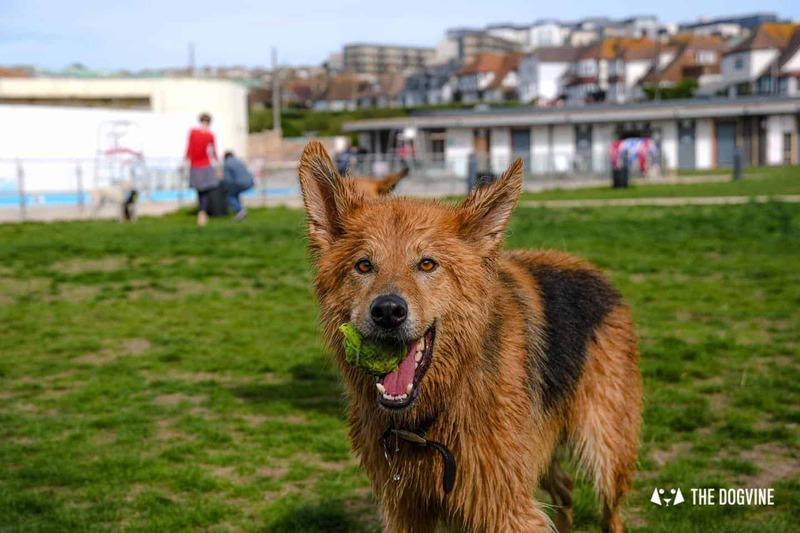 Well, the Saltdean Lido Dog Swim Day marked that month to the day and Pepsi was smiling from ear to ear about being there (and so was Pepsi’s owner). 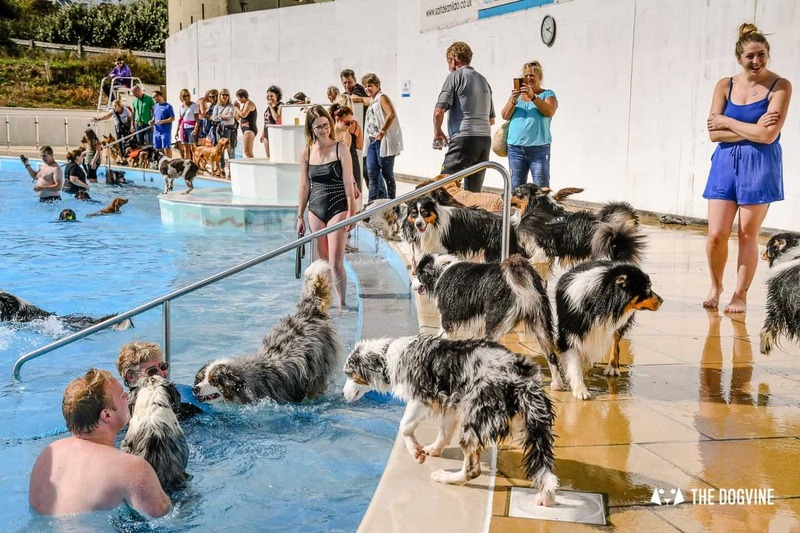 Although we weren’t joining in the swimming, you could feel the excitement from all the dogs and it was incredibly infectious. For nearly two hours the dogs didn’t stop having the best time of their lives. All too soon, the time was up and it was time to leave so the next session of lucky doggos could have their turn…until next year. 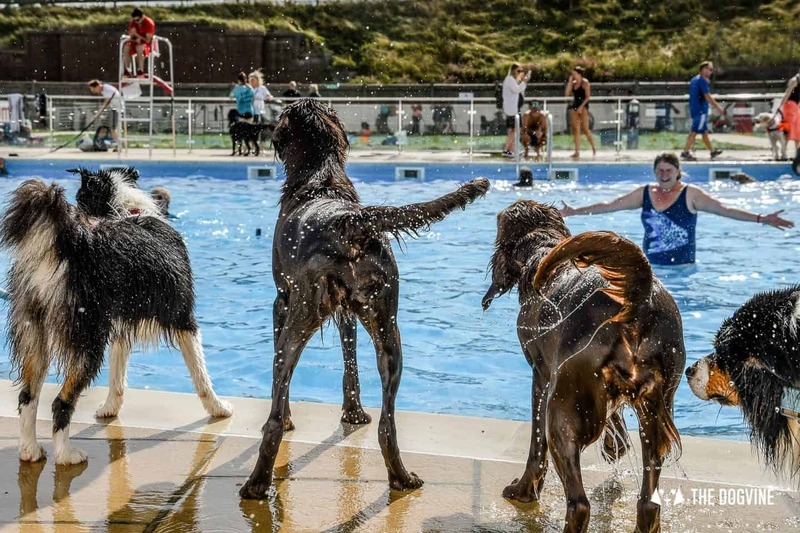 Our trip to the Saltdean Lido Dog Swim was so much fun even as spectators and I can absolutely recommend it. 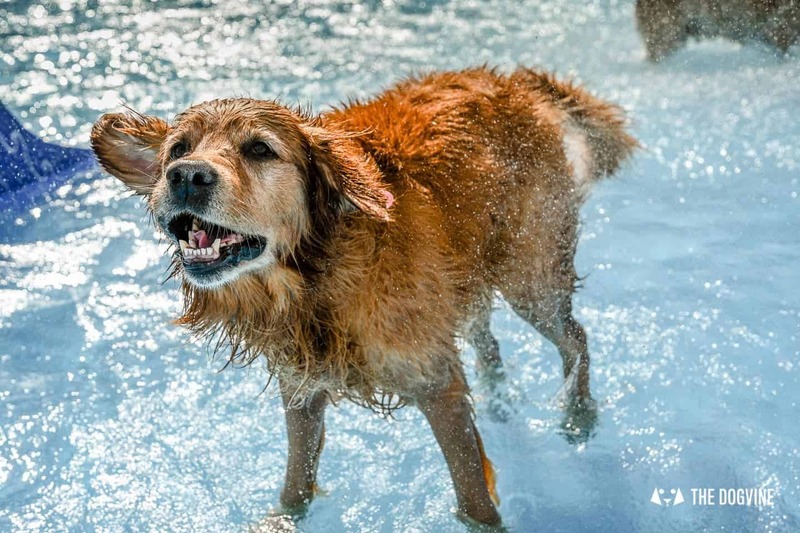 Of course even more so if you have a dog who likes water, then it’s a summer must-do on the dog-friendly to-do list. 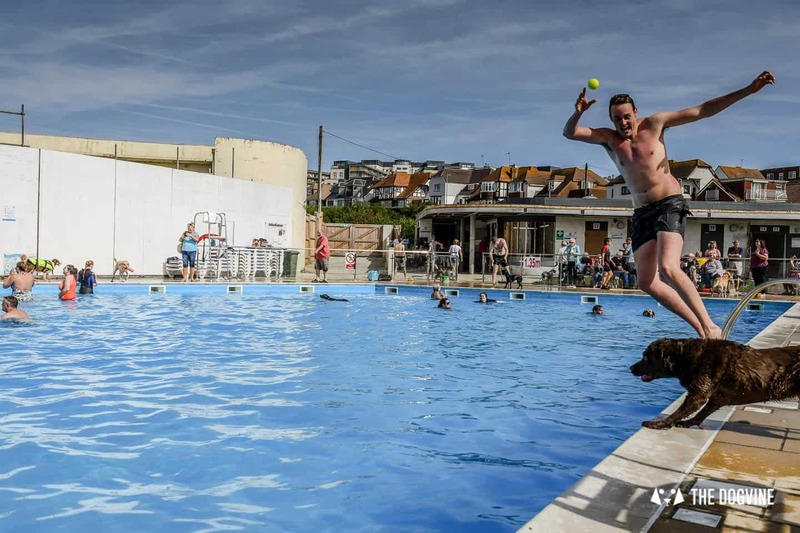 To get to the Saltdean Lido Dog Swim it’s just over an hour from Brighton on the train from London then a 20-30 minute bus ride along the coast. If you’re taking the train, bear in mind it can get busy on the weekend so if you’re traveling with your pup, I personally would upgrade to first class for an additional £5 each way. Once in Brighton, you can take the number 27 bus from outside the station or if you fancy a walk around Brighton first, then the numbers 12, 12A and 14 all go there too from Brighton Clock Tower. 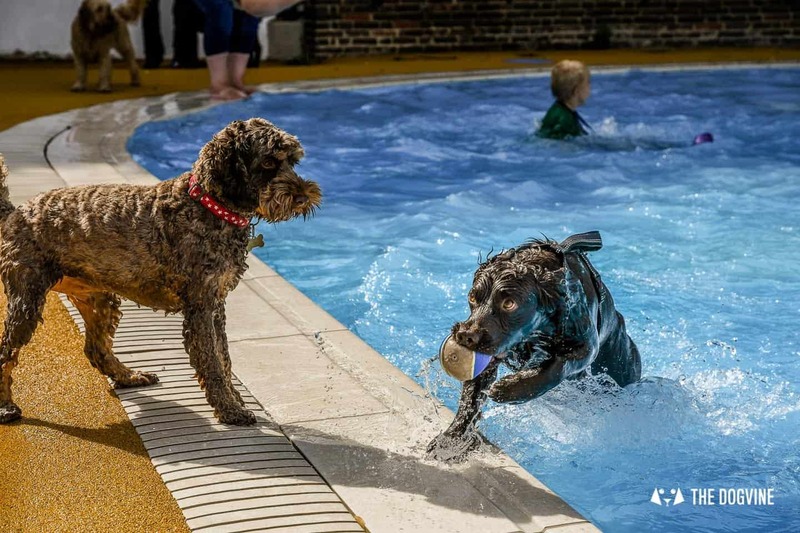 Even if you’re not going to swim, bring a pair of flip-flops as it gets very wet along the side of the pool (as I found out) and of course towels are a must both for humans and hounds. There’s a large grass area at one side of the pool so if not all your party are swimmers, they can sit back and relax on the grass and even enjoy a picnic. 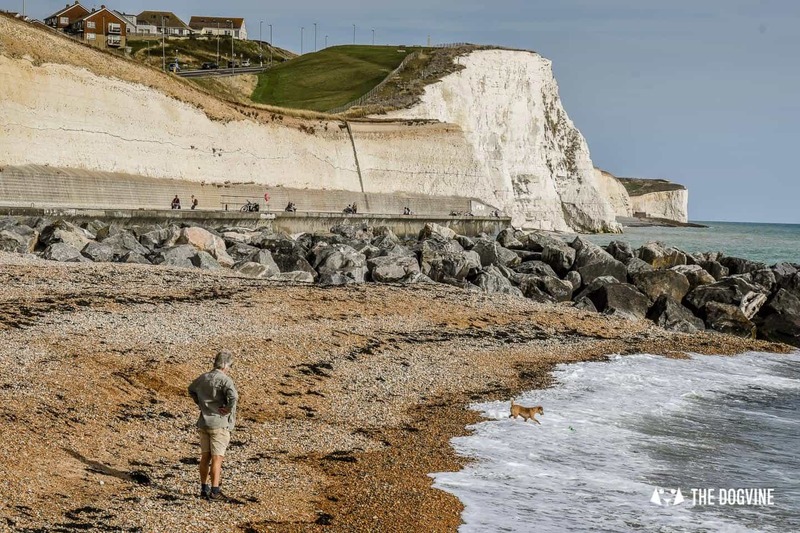 For dogs that still had some energy or those that visiting from outside the area, the beach is just a stone’s throw away. And what a view! 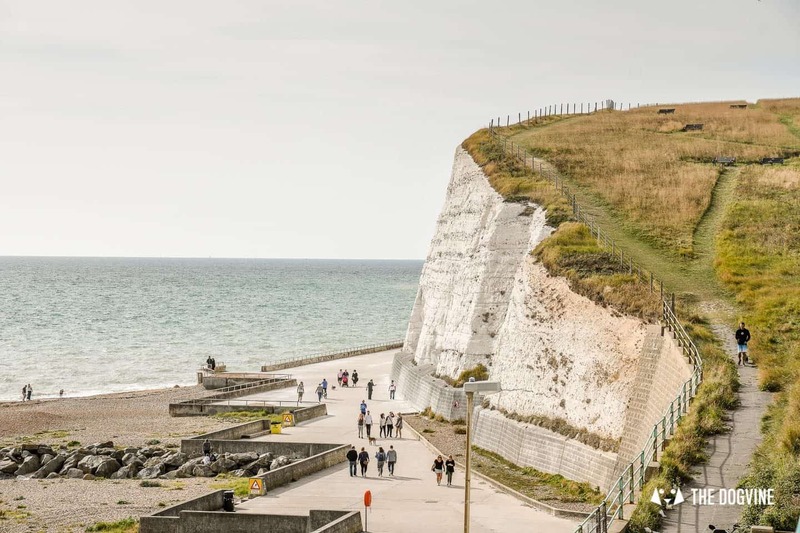 Although I grew up the other side of Brighton, I hadn’t been to Saltdean before so the impressive white cliffs were a stunning surprise. The tide was in when we went down but we did spot a few dogs taking a dip in the sea. 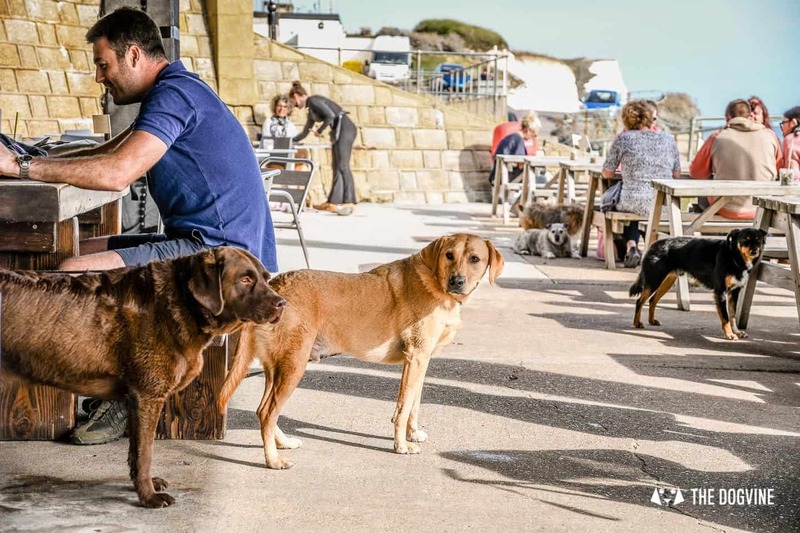 After an afternoon of doggy swimming or a walk on the beach, a dog-friendly cafe is a very welcome sight. 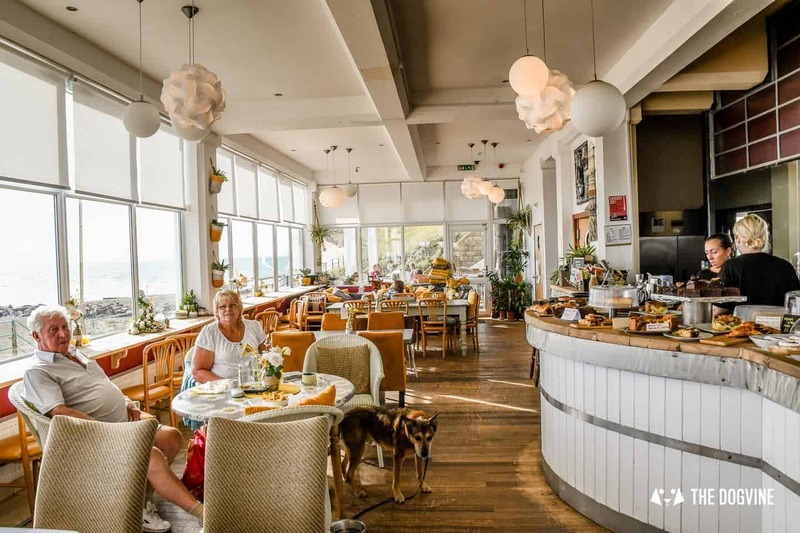 Fortunately there is one right on the beach just across from the Saltdean Lido, the aptly named White Cliffs Cafe where dogs are very welcome inside and out. 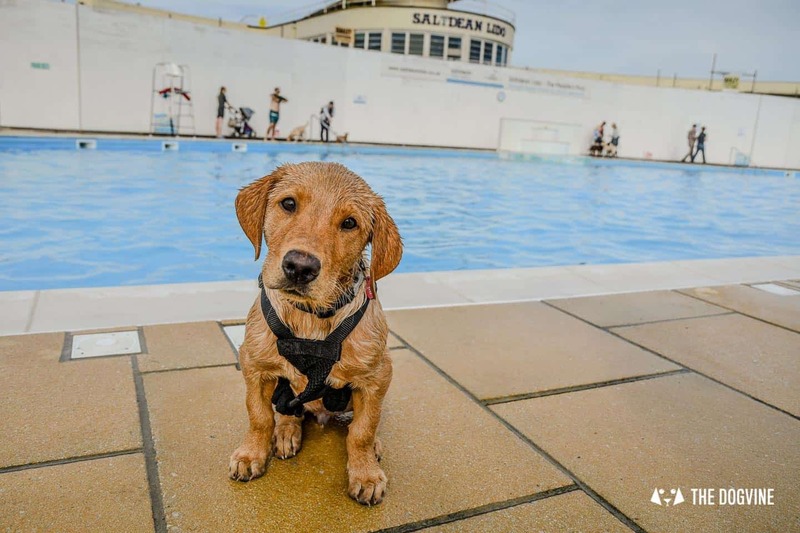 What about Lido Dog Swims for London Pups? 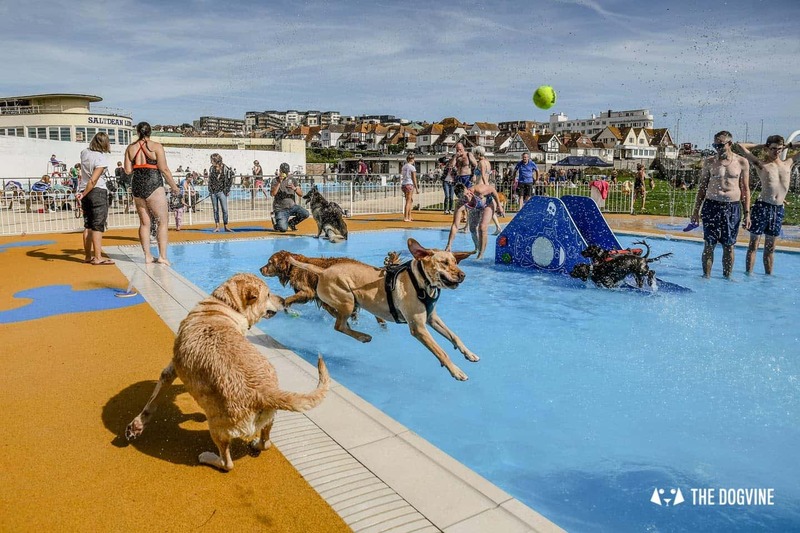 So far none of the London Lidos have opened their doors to dogs but we hope they will take the lead from Saltdean Lido and Portishead Lido in North Somerset and consider it for next year. 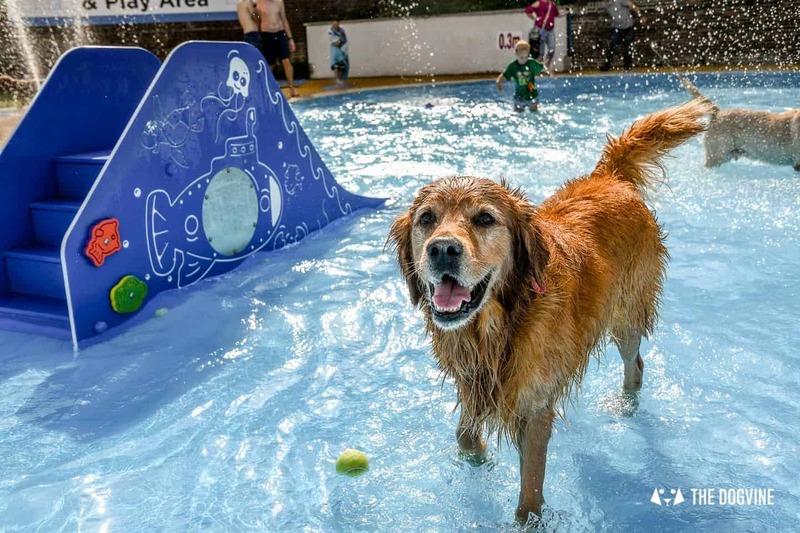 There is one option if your doggo wants to swim in a pool here in London, the end of season Doggy Splash Day at the Streatham Common Paddling Pool on 7th October. It won’t be quite the same depth of pool but still promises to be lots of fun! No need to buy tickets, all that is asked for is a donation to the 2019 pool fund on the day. 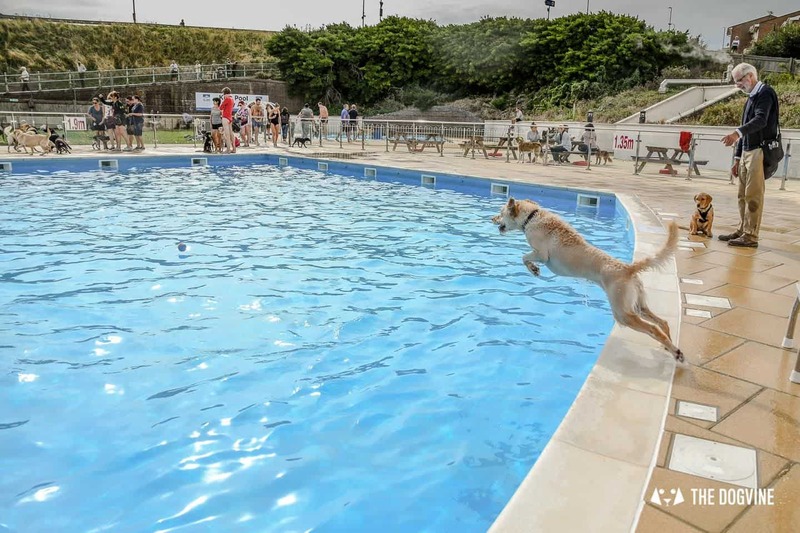 More Saltdean Lido Dog Swim photos are up on The Dogvine Facebook Page. To see more photos from Natasha Balletta Photography, please visit Natasha’s website. 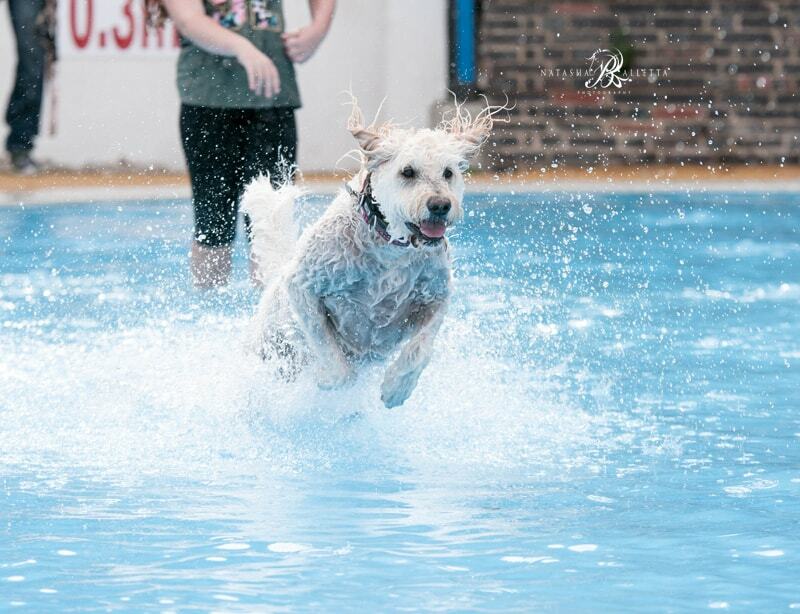 DON’T FORGET TO CHECK OUT THE LONDON DOG EVENTS CALENDAR FOR MORE FUN DOG EVENTS! Loved seeing this and what stunning photos too! I posted about one near us recently and got shot down for being dangerous and not great for the dogs, although at times these photos look busy it doesn’t look too hectic and the dogs look like they’re having great fun. Sadly we can’t go to the one we booked on to anymore, anyway, but I would of been looking forward to it after seeing this! 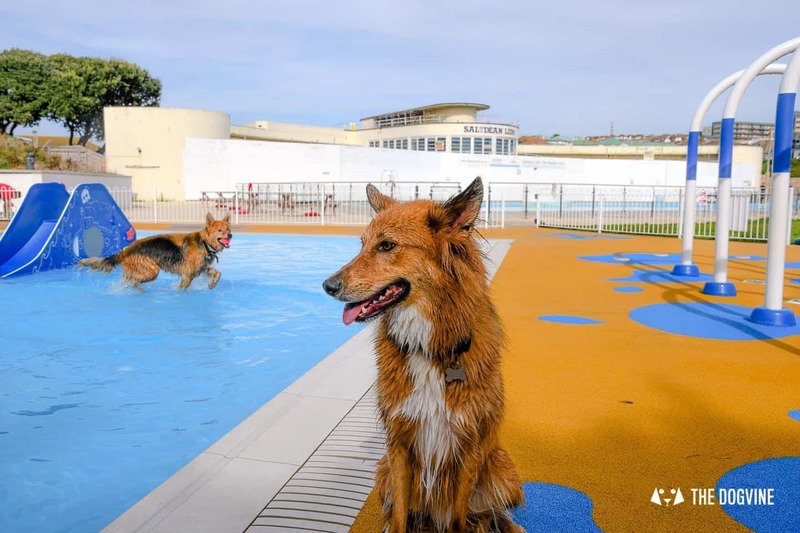 We had a brilliant time at Saltdean Lido. 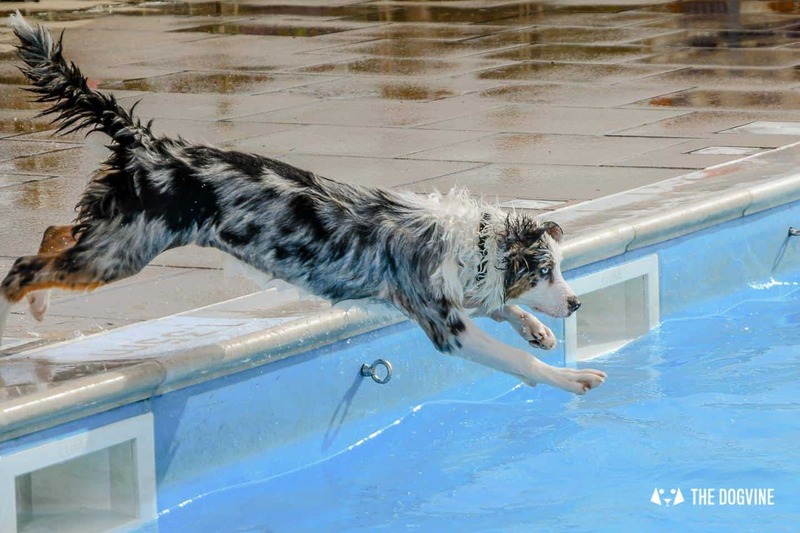 Last year Duncan hadn’t mastered swimming but loved the slide in the paddling pool. This year he had an excellent swim and was exhausted for the next two days! Maybe next year he’ll be jumping in from the side? 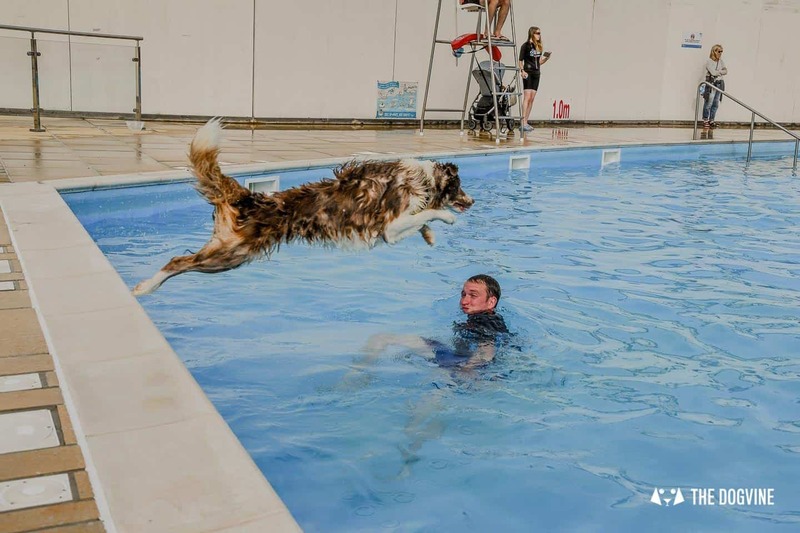 Thanks to all the volunteers who have brought the pool back to life, and for letting us share the fun with our dogs. 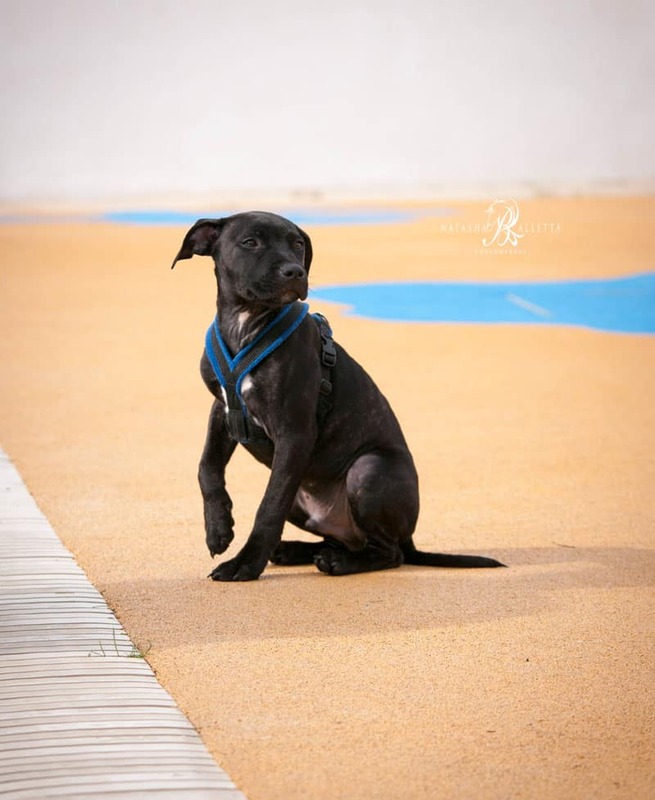 Thank you for those beautiful photos of Pepsi. She sure had a lovely day and is still here enjoying life. She had a vet check on Friday and her lump hasn’t grown so she is determined to keep proving her wrong on a daily basis.